I was at the first Dreamforce. It was in a hotel — the Westin St. Francis in San Francisco and it attracted 500 people and perhaps another 200 employees — roughly 2/3 of the entire company. The big announcements were related to sales force automation, but the company also announced custom tabs and some nifty Dashboards. These were the precursors to far bigger ambitions and 10s of thousands of successful customers. There were about 148 other major features too. And even though salesforce.com announced “features” the user community knew the company wasn’t just a company hosting sales force automation on some servers. The company’s mantra was about success (and not software). There was something far more magical happening and people realized it. Even the name Dreamforce connoted a different way of thinking than the traditional conference. I had come from a place where I was able to attend hundreds or perhaps thousands of technology conferences. They’re all dead now. They were not aspirational. They collapsed because of an implosion that resulted from a clash of egos, underachieving revenue based on ancient models, and the status quo. Without inspiration, those old conferences festered and died. You can rattle them off: Comdex, all those DCI shows that no one remembers, VBITS — there are far too many to remember. 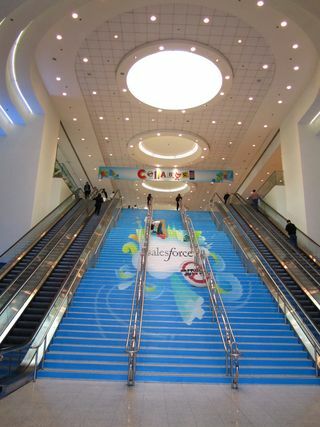 Dreamforce 2010 is aspirational. It is about Collaboration. It is about going viral. It is about building new applications. It is about design and function. Most of all it is about getting things done while simplifying things at the same time. The theme is Collaboration and we will see a lot of news around Chatter. The first is Chatter Free. Salesforce.com is redefining what it takes to go viral in the enterprise. Chatter is simple in principle. Anyone in an organization can invite someone (or multiple people) to follow an activity stream. In salesforce.com terminology, they can follow the feed, the profile, and the group. Everyone has heard about viral, virality, and little blue pills. They turned the Blair Witch project from a hokey movie into a raging success based on “virality.” Everyone copied it. Sony hired fake reviewers to generate positive reviews that rang false. Companies went viral with entertainment to a high degree. But no one really mastered the art of virality in the enterprise until it slammed them in the face with Facebook and Twitter. That’s when companies realized that their consumers used the Internet and the individuals were empowered. The Madison Avenue moguls were shaken to the core. They’re coming to terms with it now. But what is going on in the enterprise? Alas from 1994 to 2009, not much. There have been experiments. There have been tiny bubble-cash burning companies trying to get there. No one is truly succeeding and they are blowing the opportunities. In the old days, the word on the street was if you’re not on the Internet now, you’ll be dead in five years. That certainly happened with the trade shows. In recent days, if you weren’t on the Cloud, you’d be dead in two years. Now it is if you can’t penetrate your own customer base this minute, you’ll be dead next week. That’s the driving force (so to speak) behind Chatter Free, which itself contains multiple components. We’ve been testing making Chatter more viral by giving our customers ability to send viral invites. One of the things for us is that our customers need to assign their email domain to service and then admin needs to turn on this kind of viral invite capability but that’s very exciting for us and so this will be a new – exactly what you said stripped-down version of Chatter but it will operate within our existing customer network. So if you are a customer, you will be able to email and send viral invites to other customers and this I think will be just a tremendous accelerator for Chatter and we plan to turn that on for all customers shortly. Two, we will have a free independent service that’s kind of a viral service that we’ll mostly use as lead-gen and for getting customers to upsell called Chatter.com and we plan to launch that in the first quarter and that will be very exciting for us and for all of our customers and as we start to work on that Chatter.com concept, that’ll have a lot of the looking flavor that you can see of the traditional enterprise social networking sites we’re already a lot bigger than them as you know. Chatter Free is not the first viral application. But Chatter Free changes the game because it expands on the original concepts of virality without being corrupted. When an organization can freely invite people into their conversations, they more productive, they get more done, they become inspired to do more. This is not about individuals circumventing IT in order to figure out who is eating what for breakfast. It is not about a lack of trust in the vendor. It is the opposite. This is the enterprise and how it meets consumer demand. This has never happened before. Like Dreamforce, Chatter Free opens up a world of inspiration.